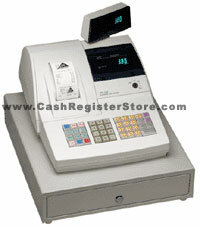 Samsung ER-380 Electronic Cash Registers at Cash Register Store. The Samsung ER-380 cash register is a perfect choice for any small retail or food service business. The high-speed thermal printer provides receipts that match the quality of high-cost POS equipment. Built-in memory can be assigned to capture transaction information for later sorting and review (electronic journal.) The flexible Samsung ER-380 keyboard can be configured with the exact functions you require, providing security, cash control and critical sales information. Other features include easy drop-in paper loading and graphic logo printing, electronic journal that captures transaction information, 500 PLUs; 12 PLU category keys (NLUs), and up to 10 clerks or cashiers with separate report totals. Now have more control of your Samsung ER-380 cash register system by interfacing to a PC for programming and reporting functionality. Yes, set up your complete program on your PC and simply download the file to your register for fast and convenient programming. Sales reports can be uploaded to the PC for easy report viewing and managing. This software is designed for a single unit only. There is no register to register communications or remote modem polling interface. Paid out account finalizing keys. Received on account finalizing keys.